NARRATIVE: Early Saturday morning on April 3rd, 2010 at 3:28 A.M., the Spokane Fire Department responded to a report of a fire in an apartment complex located at 1608 E. Mission. This building is known as the River Ridge Apartments. Engine 8 from the neighborhood fire station at Mission and Rebecca was the first to arrive within minutes and found heavy smoke and fire enveloping the second floor of a two story apartment building. An early call for an additional fire company was made given the large volume of fire and smoke coming from the structure. A rapid fire attack using Engine 8 and Engine 1 with hose lines coupled with a rapid search for occupants using Ladder 2, was coordinated on the second level of the building. At the same time, a ventilation crew consisting of Ladder 1's crew was cutting open the flat roof overhead for the fire crews inside involved in the extinguishment and search efforts. Two adult occupants along with their three children were found to be safe outside of the structure. A rapid knockdown of the flames was achieved after 20 minutes. The fire was confined to the apartment unit on the second floor and portions of the roof. Fire crews were then busy with overhaul work which consists of searching out all areas within the building for hot spots. A top to bottom secondary search of the entire complex was also begun to confirm reports that all occupants were out of the building. The apartment unit was totally destroyed as were most of the contents inside. The apartment unit below the fire sustained water damage from the extinguishing effort. The Red Cross arrived to assist the occupants with shelter and belongings. In addition to the 5 occupants displaced by the fire, there were 5 occupants in the apartment unit next door and two occupants in the apartment unit below that were also displaced by the fire. There were 4 engine companies, 2 ladder companies, a rescue unit and 2 battalion chiefs on this alarm. The Special Investigation Unit of the Spokane Fire Department remains on the scene and is currently working towards finding the cause of this fire. Given the advanced fire conditions found upon arrival, the time of night, and the large life hazard in this type of occupancy, the fire was kept relatively small and the majority of the apartment complex was saved. There were no injuries to civilians or firefighters. Fire crews remained on the scene for hours afterward checking hotspots and making sure the fire was completely out. DAMAGE EXTENT: The apartment unit was completely destroyed by fire and most of the contents which consisted of furnishings and clothing were also consumed. The apartment unit below sustained some water damage and the apartment unit next door received some forcible entry damage because of firefighters efforts to gain access, ventilate and search for occupants. The roof sustained moderate damage from the fire and vertical ventilation actions. NARRATIVE: At 1:25 AM on Friday, April 2nd the Spokane Fire Department responded to a reported structure fire at 4224 N. Monroe. The caller, a passerby, reported smoke and flames visible. Pumper-Ladder 13 arrived within four minutes and confirmed there were flames coming from the front window and door of a single story duplex. Battalion Chief Dave Haworth arrived on-scene concurrently with 13's and directed them to begin fire attack. As other crews arrived they were assigned to search the main floor and basements of both units of the duplex for victims. One adult female occupant was assisted from the uninvolved unit and evaluated for injuries. She was uninjured. There were no other victims found. The fire was quickly knocked down and confined to the living room and dining room of the fire unit, with heavy heat and smoke damage throughout the remainder of that unit. The uninvolved unit received minor smoke damage. PROBABLE CAUSE: The cause of the fire is currently under investigation by the Spokane Fire Department's Special Investigation Unit. DAMAGE EXTENT: The fire unit received heavy fire and smoke damage, destroying much of the contents. NARRATIVE: On April 1, at 2015 hours, the Spokane Fire Dept responded 4 engines, 2 ladders, 1 rescue, and 2 battalion chiefs to a reported structure fire at 2513 N Regal. The first arriving company, SE8, reported heavy smoke and fire coming from a vacant 3 story wood/brick structure. Due to the large volume of fire and the fact that this structure was vacant, the decision was made to attack the fire in a defensive manner. Heavy hose streams and an aerial device were used to apply large volumes of water from several positions. A collapse zone was established to protect firefighters should the walls fail, which in fact did occur. The fire was extinguished in just under 2 hours. There were no injuries to firefighters or civilians. PROBABLE CAUSE: The cause is currently under investigation by the Spokane Fire Dept Special Investigations Unit. DAMAGE EXTENT: Damage was confined to the structure, which was a total loss. NARRATIVE: The Spokane City Fire Department responded firefighting crews and their apparatus to the South Hill for a structure fire at 1021 E. 41st Avenue. The alarm was reported at 07:17 hundred hours this morning, Wednesday, March 31st, 2010. The first arriving fire company reported light smoke coming from the front door of a single-family residence. They reported further that they were going to stretch a hose line to the front door and make entry to locate and extinguish the fire. As additional firefighting resources began arriving on scene they were given various assignments, which included ventilation of the house and pulling additional hose leads to protect the firefighting crews who had already made entry into the fire structure. Other firefighting crews supplied water from the hydrant a block away. The fire structure is a one story single family dwelling with a full basement. The first arriving crew discovered that the fire was in the basement, and it was confined to a laundry dryer. A quick knock down of the fire was achieved with a minimal amount of water. PROBABLE CAUSE: The cause of the morning fire is being investigated by members of the Spokane City Fire Department's Special Investigation Unit. DAMAGE EXTENT: No fire damage to the structure had occurred due to the fire being contained within the dryer unit itself. In addition to the dryer, damage was confined to smoke damage throughout the basement and the first floor. NARRATIVE: On Monday March 29th, 2010 at 9:39 P.M. the Spokane Fire Department responded 3 Engine Companies, 1 Ladder Company, 1 Pumper Ladder Company, a Rescue Unit and 2 Battalion Chiefs to a structure fire in an apartment complex located at 3009 E. 53rd. Upon arrival, first in fire crews found a fire located on an upper floor balcony burning and extending into the exterior wall of the apartment complex. A quick aggressive fire attack using ground ladders, preconnected hose lines, a thermal imaging camera, self contained breathing apparatus, axes and pike poles resulted in a quick knock down of the fire and this limited the fires spread to the interior of the apartment complex where there was a single occupant sleeping. The occupant of this apartment unit was unharmed even though the apartment unit was not equipped with a smoke detector. Due to an alert neighbor who noticed the fire and called 911, and the quick response and aggressive actions of the firefighters, the fire was kept small. Because the fire was quickly engulfing the exterior siding of this apartment, the fire was only minutes away from vertically extending into the soffit space and attic above where the outcome could have been very different for not only this occupant, but for all of the occupants in this complex. A total of 19 firefighters responded to this alarm. The fire cause at this time appears to have started from a discarded cigarette near a planter and wooden bench kept on the exterior balcony. Many people are of the belief that planter material in a container is made of dirt and non-flammable and therefore capable of extinguishing a cigarette. This is not the case. Planter material is in fact very flammable as it is composed of combustible fuel and because this fuel is in fine form, it readily ignites and will sustain flaming combustion. 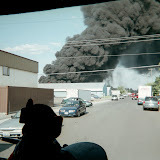 The Spokane Fire Department would like to remind everyone to exercise caution when using ignited materials and to extinguish these materials properly. There were no injuries to firefighters or civilians at this fire. PROBABLE CAUSE: Improperly discarded cigarette. DAMAGE EXTENT: Fire damage to exterior balcony decking, bench, exterior siding and insulation. NARRATIVE: On March 22, 2010 the Spokane Fire Department responded at approximately 7:22 PM to 5408 North Washington on a reported structure fire. The first crew on-scene reported smoke and fire showing at the northeast corner of the 1.5 story, wood framed and concrete block, single family residence. The structure's basement was fully involved with fire and the fire was advancing to the main floor area via an open stair way leading from the basement. The fire was also entering the attic space through a gable vent on the structure's east side. Fire fighters aggressively performed an interior attack on the fire while additional fire crews completed search and rescue, roof ventilation and salvage and overhaul. The fire was brought under control within 30 minutes. One firefighter was transported to a local hospital for a possible leg injury. Nine fire companies with 27 firefighters and 2 chief officers responded to this fire and were on scene for approximately 2.0 hours. Four adults were displaced by the fire and are being assisted by the Spokane Chapter of the American Red Cross. The Spokane Fire Department would like to take this opportunity to state the importance of installing properly working smoke detectors through out your home. The occupant's of the home were alerted to the fire in the basement by a smoke detector and were able to safely exit the structure. PROBABLE CAUSE: The cause of the fire is under investigation by The Spokane Fire Department Special Investigation Unit.